Over the weekend, I was watching the newly posted items scroll at the bottom of the Etsy website (as usual) and came across a gorgeous gold necklace. When I saw that the artist, Kate, was Canadian, I knew what I would be featuring today. Kate lives in Whitby, Ontario, a place I've actually been to (a friend went to school there, and we would get rides home with him)! She runs her shop, kateszabone, full/part-time, the rest of her time being spent as a domestic goddess. If you read through her profile, you'll see that Kate used to be in real estate, but found that it wasn't something she loved to do. 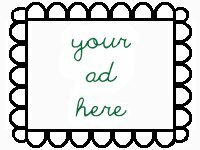 Now she designs unique jewelry, and has been doing quite well as evidenced by her shop, which has only been open since January and already has over 500 items sold! I think this speaks to the quality and graceful designs of her work. I definitely think she made the right decision in switching!! 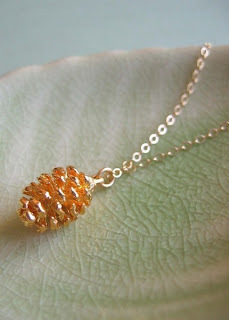 The first necklace I saw and fell in love with is this lovely gold-dipped pine cone. This brings me back to my childhood, during my favourite season, Autumn: I grew up in the country, and we had a huge oak tree and several pine trees in my front yard (as well as many maples, birches, cedars and others in the forest on my parent's property). I remember collecting pine cones, acorns, coloured leaves and branches for crafting ~ I would make wreathes with my aunt and Thanksgiving baskets / centerpieces. Classically fall ~ and now you can wear it around your neck! The intricacies of the pine cone are beautifully preserved in the 24k gold. This pendant would make a great addition to any jewelry collection and would also make a wonderful gift, especially if shopping for anyone who is environmentally active or a lover of the great outdoors. You can also find other amazing gold-dipped pendants in kateszabone shop ~ I'm particularly fond of the dipped coral (random shapes, with the natural red-pink coral showing through) and conch shells. The next item that I'm trying to live without is these wonderful sea grass earrings. I couldn't find a more fitting name: the 14k gold filled flattened and curling wire looks just like sea weed. I can imagine my hair getting tangled around in the grasses just as my feet would while swimming in the river or lake (HATE that feeling, never fails to send a shudder down my spine). Thankfully these weeds aren't black-green and slimy! And tangled within them aren't your feet, but tiny faceted blue labradorite gems. 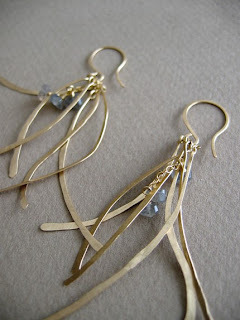 The frosty gold of the weeds and light blue of the gems create a fantastic watery feel to these earrings. You can tell that these earrings would constantly be dancing to the movement of your head and ambient breezes, just as if the seaweeds were caught in a gentle current. Simply lovely!!! 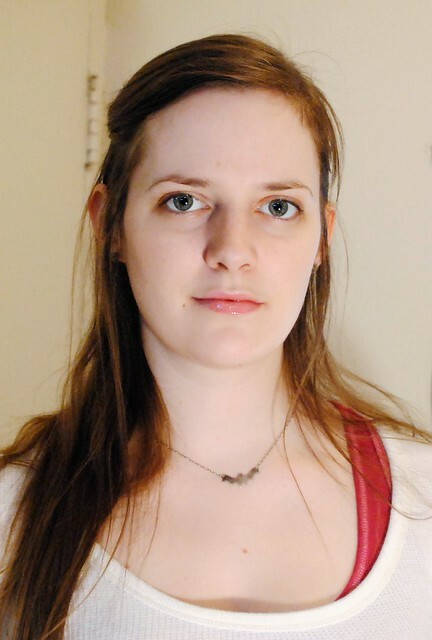 If you're looking for simple and understated beauty, please check out kateszabone's shop. She has an extensive collection of hammered and wrapped bangles, plain hoop, loop and leaf silhouette earrings and many more!! Most, if not all, of her pieces have an effortless feel to them, something clean and classy you could wear all the time ~ be it for the mundane (grocery shopping) or for special occasions. 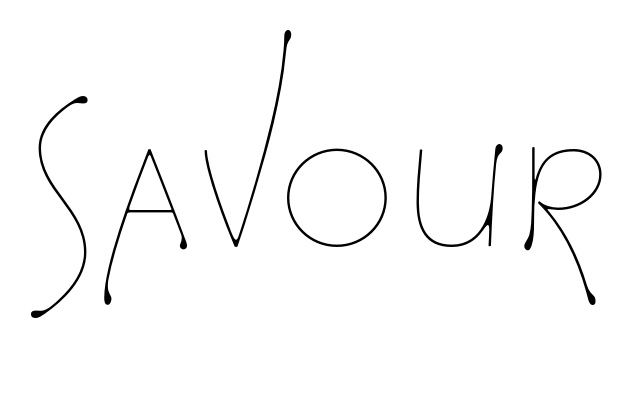 Check it out: you won't be disappointed!